Ken Winneg, the Annenberg Public Policy Center’s Managing Director of Survey Research, and Bruce Hardy, an APPC Distinguished Research Fellow and Assistant Professor at Temple University, spoke on WHYY‘s Radio Times with Marty Moss-Coane about politics and the impact of social media. They discussed the advent of social media being used in presidential campaigns, how candidates and their campaigns use different platforms (with varying levels of success), and some of the consequences of this media revolution. Listen to full audio below. Click here for more information about the show on “Ballot talks: Politics and social media” on the Radio Times site. 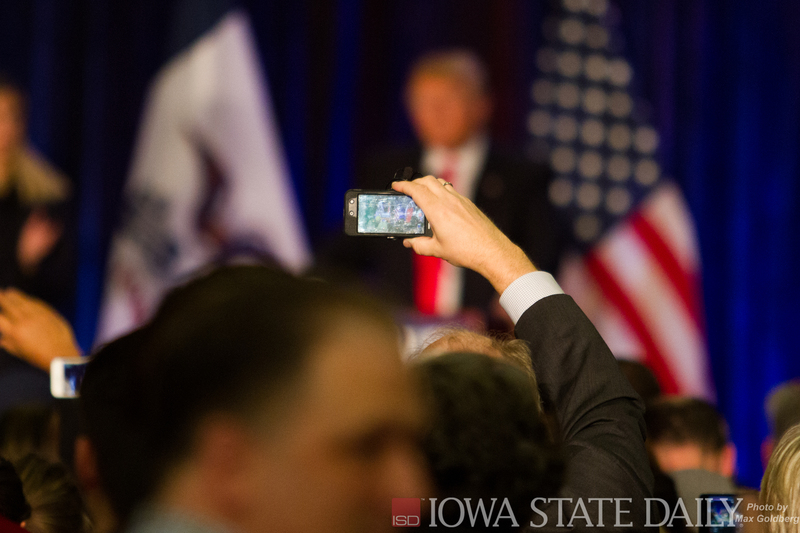 Republican presidential candidate Donald Trump being recorded as he speaks to a crowd. Credit: Max Goldberg/Iowa State Daily.